This is a book for families with their own Little Pea. Little Pea likes rolling down hills super fast. He hangs out with his pea pals. In Little Pea's life there are swings and snuggles and stories and cries of "Again! Again!" when Papa Pea sends him sailing through the air from the end of a spoon. And just like most little peas you know, there's one thing he doesn't like. It comes at dinner time. There it is on the plate. What is it that your little peas absolutely, positively don't want to eat? Every night threats of "You're not leaving the table until..." and "If you don't eat what you have I'll give you more..." fly across the table. What could this nastiness be? Every day of the week, Monday through Friday, weekends too, it's candy for dinner. Grow up big and strong? Dessert? Not without your candy. What?!? FIVE pieces?!? Just like little peas across the country, this Little Pea chokes them down, squinty-eyed and not without a running commentary on how icky it truly it is. Blech! Candy. 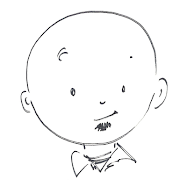 Readers will giggle all they way through once they recognize this nightly struggle through different eyes. And it will certainly make all the little peas out there eager to eat their vegetables every night without complaint. Ah, who am I kidding? That'll never happen. 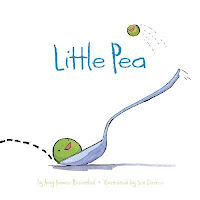 However, Amy Krouse Rosenthal's book may help all little peas, just like Little Pea in the book, finish that detestable food so they can finally enjoy the best part of the meal. Spina...um...I mean, DESSERT!